Almost 24-hours after Israel agreed to international demands for a ceasefire, thus strengthening Hamas' standing whilst dealing yet another blow to the Palestinian President Mahmoud Abbas, President Shimon Peres stands strong by his side, calling on Israel to return to negotiations with him. According to the president, now, with the military chapter over, there is a need to begin the political chapter: "I see a partner in Abbas. I have always seen a partner in him. For Abbas to say that he is against terror, for peace, for a demilitarized Palestinian state, for the refugee issue to be dealt with in a just and agreed upon manner through negotiations; these are things that are unacceptable in the Arab street, and yet he says them loud and clear. Hence, I definitely see him as a partner." According to him, now that the military chapter has come to an end, "there is a need to look forward, to the future chapters, and the next chapter is political. We need to return to the negotiation table. There are new players and new alignments in the Middle East, some good and some bad." "Iran, for example, (has) been arming Hamas, sending them all their rockets and munitions so they will fire them at Israel. Iran is also responsible for arming Hezbollah; it is filling the Middle East will rockets. Hence Iran is not just dangerous in regards to its nuclear ambitions but also because it is the number one terrorist in the world." Peres also discussed Egyptian President Mohammed Morsi, saying he understands the importance of the US-Egypt-Gulf States axis. He predicted that this axis will stand in opposition to the Iranian axis as well as its satellite Hamas: "The elected Egyptian president has shown responsibility and statesmanship. He has proven that he sees the wider picture and not just the narrow and local interest." Regarding the reasons for the ceasefire's timing, Peres said: "For every move their needs to be a reason. This was not just an exchange of gestures. Apparently, enough good reasons accumulated for both sides to lead to an end to the fighting, and these reasons did not disappear. If, god forbid, the firing will continue, then the operation will have to be resumed." The president believes Israel should dedicate the days following the lull in fighting to "present a political initiative. There are so many things that need to be done. We should recall that it was the US president that excelled in outstanding behavior, pushing for a ceasefire. This was a great thing." 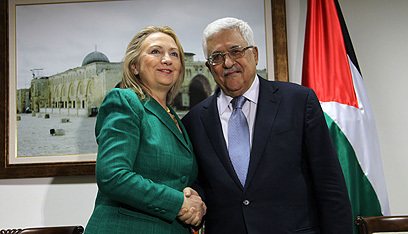 The US efforts to bring about a ceasefire were mostly headed by Secretary of State Hillary Clinton, who visited the area and met with Abbas after meeting with high ranking Israeli officials. Before taking off to Cairo she chose to hold a symbolic meeting with Abbas in Ramallah. As part of the visit she attempted to return Abbas to relevancy, even though she herself hasn’t visited Ramallah for over two years. In the days leading up to the ceasefire, Peres took on the job of helping the Israeli public relations effort, communicating the Israeli narrative to world leaders. In addition to phone calls, he held meetings with UN Secretary- General Ban Ki-moon and German Foreign Minister Guido Westerwelle, as well as with other international diplomatic delegations visiting in Israel at the time. During all these meetings it became overwhelmingly evident that Egypt also sees great value in Israel returning to peace negotiations with the Palestinians, a move it believes will help strengthen moderate Palestinians. In regards to harsh criticism that was leveled regarding the ceasefire's stability and sustainability, Peres said: "I hope the agreement will hold. The main consideration for everyone needs to be the safety of the region's mothers and children. "Too many have suffered. I have seen mothers with two or three children, running for their lives, it breaks my heart. If, god forbid, the calm will be broken, then something needs to be done to restore it. I think Hamas has suffered a lot as well." "At some level we needed to have it stopped already," Peres said of the conflict in the south. "It is possible to say at any point that it is too early or too late. I think that it was well within the government's authority to make such a call, and it exercised its authority in a worthy manner." 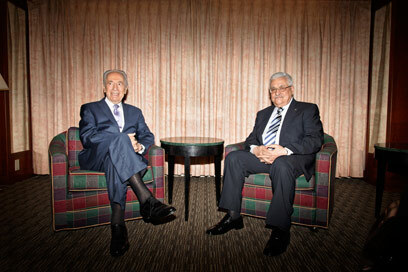 See all talkbacks "Peres to Ynet: Abbas, not Hamas, is the partner"